Comment: This book has been looked after very well and will have minimal signs of use, if any. 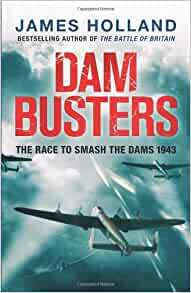 Start reading Dam Busters: The Race to Smash the Dams, 1943 on your Kindle in under a minute. This is not as good as Fortress Malta, which was sublime. It could have done with being 100 pages shorter; James Holland seems to mention everyone who took part in the raid. He hops between the scientific work of Barnes Wallis and the progress of the war, including the formation of 617 squadron, which was fine. But, particularly near the beginning, he hopped back and forward through time, which was less helpful. I sketched my own management chart to keep track of all those in the different departments who had a part to play. It is said that Brickhill's book was flawed because he did not have access to files that have since been declassified. But, to be honest, any differences are in the detail and I'm uncertain which account to trust. Holland says that 'Bomber' Harris scribbled the following words on a memo "This is tripe of the wildest description. There are too many ifs and buts that there is not the smallest chance of it working". On page 124 it is on a memo from his SASO AVM Saundby but on page 160 the memo is from Bottomley. I'm not sure if it was Brickhill's book, but I have read that Wallis's original spherical bomb was too big to sling beneath a Lancaster so he needed to replace it with a cylinder. According to James Holland, the switch was later and because the spheres kept breaking up on impact with the water. Which is correct account I wonder? Perhaps a Dam Buster enthusiast can put me straight? To be fair I would have awarded four and a half stars (or 9 out of 10) if that were an option and, on the strength of Fortress Malta alone, I would read other books by Holland. James Holland's book goes far beyond the limitations of the cult 1955 film 'The Dam Busters' and brings together a substantial amount of information on the events leading up to the attack on Mohne, Eder and Sorpe dams on the night of 17 May 1943. When presented with the initial concept of attacking the dams with a bouncing bomb the first reaction of Air Marshal Sir Arthur Harris (C-in-C of Bomber Command) was that 'this is tripe of the wildest description ... there is not the smallest chance of it working.' But, after a discussion with Air Chief Marshal Lord Portal, Chief of the Air Staff, Harris changed his mind and did everything possible to make the project a success. This fascinating insight into the command structure of the RAF (and the various Ministries and industrial companies involved in the project) is supplemented by personal profiles of many of the men, several from various countries of the then-Empire, who'd make the attack. They were generally very young - Gibson was 25 and had already completed 154 operational sorties; his two flight commanders were 21 and 22. The project was approved against an impossibly short, three-month, timescale. In that time they had to assemble a force of 19 specially adapted Lancasters and train 133 aircrew whilst, as Holland emphasises, the design of the actual bomb was still far from complete. Earlier tests on a small prototype had simply demonstrated the concept. Everyone was also well aware that low level night attacks by heavy bombers over heavily defended areas of Germany were close to suicidal. The Lancaster was a large aircraft with a wingspan of 102 feet and, including the bomb, would weigh 30 tons. In order to avoid German radar and night fighters 617 Squadron would cross the North Sea at around 200 feet and then, over the target, drop to 60 feet. The correct 'bounce' required that the three-ton bomb - spinning at 500 rpm and code-named Upkeep - be dropped at a precise distance from the dam from an aircraft flying at 220 mph. Eight of the 19 aircraft, each with a crew of seven, failed to return from the mission. Despite these losses - and earlier analyses - James Holland's research shows that the raid was a success. The knock-on effect on the production of German munitions, weapons and aircraft was significant whilst German prestige and the war effort demanded that the Mohne and the Eder dams be rebuilt and fully functioning by the autumn, some five months away. It required moving 70,000 workers into the area and confiscating essential machinery, no matter the consequences, from wherever they could be found. At today's prices the reconstruction work cost the Nazis close to £6 billion pounds. Part of this operation - it was completed on time and, strangely enough, without further attacks by the RAF - also involved the withdrawal of 7,000 labourers from construction work on the Atlantic Wall. This shift in resources resulted in Rommel's planned defences against the Allied invasion on 6 June 1944 being significantly weakened. It's interesting to note that a smaller version of the bomb, code-named Highball, was proposed for use by RAF Mosquitoes against German shipping and the Nazi's remaining capital ships. Highball was never used and Upkeep was only used once, on the attack on the dams on the night of Monday, 17 May 1943. In September 1944 Gibson flew a Mosquito on a mission over Germany but, on the return leg, the aircraft crashed in Holland, killing both Gibson and his navigator. Whilst the formal RAF report assumed he either ran out of fuel or was hit by enemy ground fire recently released evidence suggests that a Lancaster bomber, returning from a separate raid over Germany, mistook the Mosquito for a Junker 88 (both are twin engined aircraft with a single rudder) and opened fire, destroying the Mosquito. 'Dam Busters' is an excellent and informative book - a first-class companion to Target Tirpitz - The Epic Quest to Destroy Hitler's Mightiest Warship - and thoroughly worth reading. 5.0 out of 5 starsAn amazing story! I thoroughly enjoyed this book. It's very insightful. 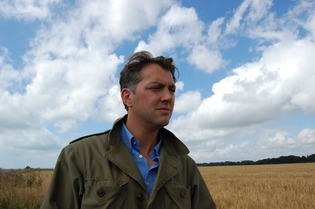 James Holland gives you so much more than the story of the raid, you feel part of the planning process, you read about the heroes that risked their lives; personal accounts of relationships as well as how they were feeling about the bombing missions and the toll the war was taking on these brave men. You also get a good account of what happened after the raid, personal accounts from the aircrew and those affected by the breaches to the dams; it must have been truly terrifying to have lived in the path of the torrent that followed. A well written account of a very important piece of our history. impeccable . it's a subject that never ceases to enthrall. this book conveys so much more than just known facts. it delves into the emotions and the actions surrounding this iconic and highly emotive war time raid. It grips the emotions and the interest from start to finish. A great and highly instructive account of this daring, brave and famous raid and all it's participants.